If you’re to believe the words of a certain flame-haired Wildling, poor Mr. Snow doesn’t know anything. Even if that were true, at least his action figure knows one crucial thing: How to look pretty goddamn fabulous. 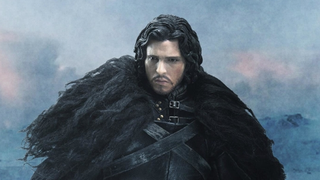 The latest in ThreeZero’s Game of Thrones 1:6 line — which already includes a lovely version of Jon’s dad, Ned — depicts Kit Harington’s Jon Snow, clad in the furs and leathers of the Night’s Watch, looking all stern and ready for the bad things that inevitably happen in Westeros. And it’s a good likeness, too, although admittedly not that hard, considering I’m pretty sure Kit Harrington pretty much has one face, and that’s the above wonderful blend of consternation and looking like he’s thinking “I really, really need to poop”. Such range, perfect for an action figure, right down to his exquisitely tousled locks. Aside from the eerily accurate headsculpt and the wonderful material clothes (I really like the fur cloak around his shoulders — fabric is usually a nightmare at smaller scales to look right, but here it’s practically spot on), Jon comes with some alternate hands to either stand neutral or grip his Valyrian steel sword Longclaw and his dagger, which are also included. If you preorder the figure directly from ThreeZero too, you get a pretty excellent bonus accessory: an in-scale model of Jon’s Direwolf, Ghost! Jon Snow will go up for preorder May 15th, at 9:00 AM Hong Kong Time (that’s 6PM PDT/9PM EDT May 14th) ahead of a release later this year. $160 will get you Jon on his own, and $190 will get you Jon and Ghost as a two-pack.